One of every four people on Earth is a Muslim; so, here are some information about “Ramadan” month in a question and answer form. Ramadan is one of the holiest months of the Islamic calendar. It is the ninth month of the Islamic-Lunar-year calendar. Muslims perform fasting (abstaining from eating, drinking and having sexual relations during daylight hours; from dawn to dusk) as a religious obligation. The Islamic calendar is a lunar calendar, it is shorter than the solar evangelic calendar by eleven days. So; Ramadan moves around the solar year by eleven days annually. How to Fast in Ramadan as a Muslim? Muslims are obligated to fast every day from dawn to sunset (or from dawn to dusk). Fasting is an obligatory act of worship which is abstinence from food, drink and sexual activity with one’s spouse during the day, but that’s the minimal amount of fasting. Actually the Messenger (PBUH) and Muslim scholars following his footsteps have explained that fasting is not the day time worship only but all day and night commitment to please The Lord with what He likes. Fasting is preventing oneself from engaging in any behavior that displeases God. Simply it’s a “Boot camp for Good Behavior” to please Allah day and night for thirty days. Every, adult, sane and capable Muslim is obligated to perform fasting. Who may not perform fasting of Ramadan? * Every Muslim that has a valid excuse, for example children , insane people, women in menstruation or postpartum period, during pregnancy or lactation; if she fears harm to herself or her baby, during traveling, during illness, and elderly people who cannot observe fasting. All those Muslims are excused from fasting. 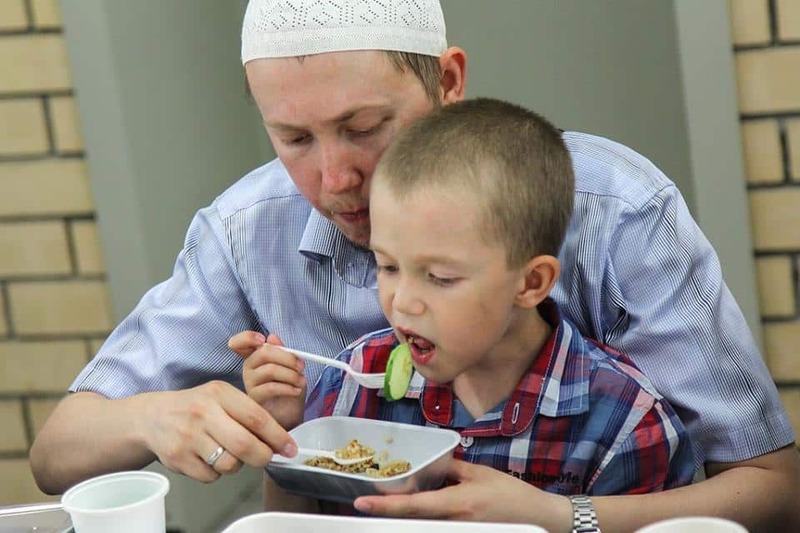 But those who break fast for traveling, for a temporary illness, or women during menstruation or postpartum period, pregnancy or lactation ,have to make up the days of breaking fast after wards, whenever the excuse is alleviated. If their excuse is not expected to be alleviated, as in case of fatal illness or old age people, they should make compensation by feeding a poor person for each day they did not fast. When was the fast of Ramadan decreed? Fasting was decreed in the second year of Higra (the second year after the Messenger’s migration to Medina) by the revelation of this verse, O you who have believed, decreed upon you is fasting as it was decreed upon those before you that you may become righteous “ (quran.com/2/183). The Messenger PBUH fasted nine consecutive years (months of Ramadan) before his death. What is the purpose of fasting in general and Ramadan in particular? Fasting is an ordination so, Muslims obey and say, … And they say, ‘We hear and we obey. [We seek] Your forgiveness, our Lord, and to You is the [final] destination.” (quran.com/2/285). Fasting in general and fasting of Ramadan in particular is to gain Taqwa which is “The most important Gain“. Allah says in Quran, “… that you may become righteous” (quran.com/2/183). Taqwa is obtaining piety and righteousness, which is the goal of fasting and all worship acts, as it’s our hearts that Allah observes not our exteriors. Our submission, obedience and steadfastness on the way of righteousness are the means to purify our souls from every sin and disobedience. Fasting of Ramadan makes one appreciate the blessings one has as he abstains not only from prohibitions but also from some permissible things like food, drink and Halal relations with spouse. Fasting teaches patience and endurance. One perseveres in his subjugation to His Lord as no one but Him is Observant of one’s sincerity and Capable of rewarding for this act of worship. Fasting is a crash course in self-control. One truly experiences his own strength in fighting and controlling desires, temptations and Satan’s whispers. Fasting of Ramadan is a means to be in Allah’s remembrance in secret and in public all the time. Fasting helps Muslim to feel the pain of the poor and subsequently have it in his heart to be merciful, compassionate and giving (kind and charitable). Is it only days of Ramadan that are special or Ramadan nights as well? Nights of Ramadan are as special as its days, as Muslims are recommended to exert their utmost efforts to please their Lord with all sorts and kinds of worship acts and with prayers in particular. Rewards for all acts of worship and good deeds are multiplied. Muhammad PBUH set an example by praying extra prayers and striving even more during the last ten days and nights hoping to gain the rewards of “The night of The Decree” during which the revelation of Quran commenced. Quran revelation started on one of the nights of the last ten days of Ramadan. It was during the year 610 A.D.
“The night of The Decree” or “The night of Rower” which is a blessed night when God emancipates Muslims from entering Hellfire, gives blessing and alters decrees if He Wills. Fasting of Ramadan is one of the five pillars of Islam. All good deeds rewards are multiplied, as well as sins for all bad deeds. For fasting Ramadan sincerely, out of faith and in the hope of reward, a Muslim will be forgiven all his previous sins, provided the major sins are not committed. There are several Hadithes that give glad tidings to Muslims of forgiveness, emancipation from Hell fire and great rewards for those who do well and are sincere. Fasting of Ramadan is an obligation on every adult, sane and capable Muslim. It’s one of the five pillars of Islam. It is abstinence from food, drink and sexual activity with one’s spouse during the day. Fasting is not a day worship as taught by Muhammad (PBUH), it’s a full day and night sincere observance of God; abstaining from all bad deeds and sins day and night as well as the day fast. Even non-Muslims try the “Challenge of Fasting” for the health benefits discovered recently. So, what about you? Would you like to give it a try?